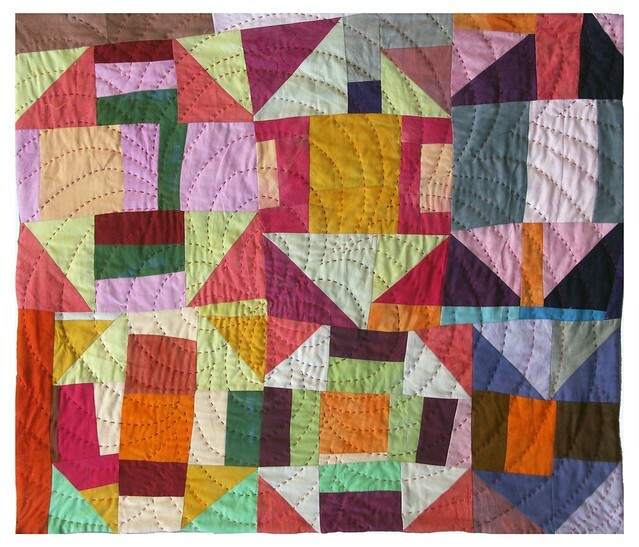 Welcome to Improv Mondays, a weekly series exploring improvisation in quilt making. Traditional quilt making involves a lot of repetition - from the cutting of shape-after-shape out of the cloth, to sewing the pieces together block-after-block, to the in-and-out of the thousands of stitches it takes to hold a quilt together. I love the meditative quality of traditional quilt making that comes from repetition. Not surprisingly, repetition plays a fundamental role in my improv quilt making process as well. Choose any traditional block pattern as the beginning score. Alter the block pattern as desired through multiple repetitions. Alterations may include, scale, size, order, color, value, etc. Alterations may result in more complex or simplified iterations of the pattern. Not every block has to be used in the finished quilt. I improvised the piece shown above using the Hole In The Barn Door as my beginning score. Can you identify my first block? Can you follow the order of my iterations? I heard the Mattie Bye Ensemble do live TRANCE IMPROV at a club in Oakland a couple of weeks ago. It was a fantastic! Here's a taste of what it was like.